The Islam Awareness Blog: Has Afghanistan War achieved anything? Elections have concluded but what has been achieved? Very few people bothered to vote. There were widespread fraud and whoever wins, though democratically, nothing much will change. Lal Mohammed was determined to exercise his right to have a say in his country's future and vote in the election. It was a decision for which he paid a horrific price. 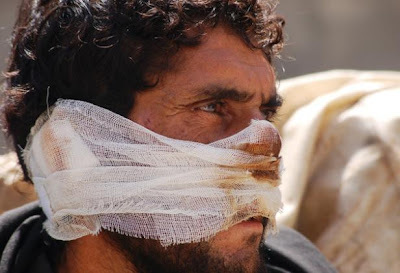 On his way to the polling station he was held by Taliban fighters, beaten brutally, and then had his nose and ears slashed off. taken by insurgents on someone who had defied their order to boycott the polls. And it helps to explain why so many people throughout the country were simply too afraid to vote. Mr Mohammed has now been promised surgery by the hospital. His main concern, he says, is his family. "There are 11 people and I am the only breadwinner. My youngest child is two years old, I do not know what is going to happen to them, who will look after them..." his voice broke into sobs. The Taliban had vowed to disrupt the election and had repeatedly warned people against participating. On polling day they carried out a series of attacks across the country killing 26 people and injuring about 80. There were subsequent reports, uncorroborated, that they cut off the ink-stained fingertips, which showed they had voted, of a number of people. However, Afghan and Western officials accept, and The Independent can confirm, that election monitors failed to turn up in vast swaths of the south because it was deemed too dangerous and little or no record was kept of the intimidation which took place there. And its not been any better for the occupiers. The tally of dead British soldiers currently stands at 208, but some senior officers believe this could rise sharply. The numbers of those wounded and maimed have soared by 300 per cent in the past three years as the increasingly bloody struggle to maintain order has intensified. New figures obtained by The Independent on Sunday also show that the numbers claiming compensation for injuries sustained in Iraq and Afghanistan are more than 12 times higher than the total in 2005. Unpublished figures from the Armed Forces Compensation Scheme (AFCS) reveal in disturbing detail the "hidden costs" of the military action, with soaring numbers being forced out by wounds. The number of soldiers applying to the AFCS for financial assistance after being medically discharged rose from 200 in 2005-06, when the scheme opened, to 845 last year. Troops claiming for injuries suffered in service rose from 240 to 3,255 during the same period. The figures also show that the numbers of "post-service" claims has risen by a factor of almost 100, from 15 to 1,455 since 2005. A Ministry of Defence spokesman admitted the heavy toll is due to the number of people experiencing post-traumatic stress disorder (PTSD) after leaving the services. The MoD's latest assessment of psychiatric health problems within UK forces, completed late last month, showed there were 3,181 new cases of "mental disorder" in 2008 – 16 cases for every 1,000 personnel. Troops who had been deployed to Afghanistan or Iraq showed high rates of "neurotic disorders", including PTSD, with the Royal Marines affected more than all the other services. So can anyone tell us what has been achieved?